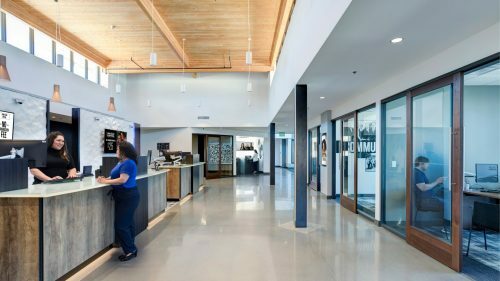 SEATTLE, WA (October 23, 2014) – The James Pedas Communication Center (The Pedas Center) at Thiel College was dedicated in front of a crowd of hundreds of students, alumni, faculty, and community members on Oct. 4. It has quickly become a hub of student activity and learning on the Greenville, Pennsylvania campus. 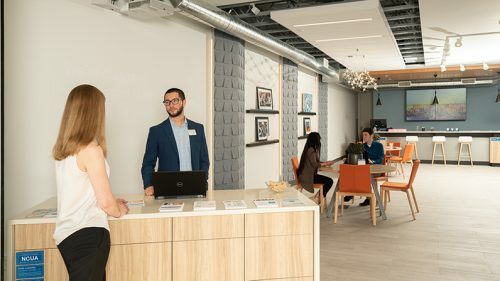 The Pedas Center is Thiel College’s first new classroom building in more than 40 years, and features state-of-the-art film, TV, radio and news production equipment, a high tech 98-seat auditorium, open collaborative spaces, study nooks and interactive classrooms. Not only a tool for enhanced collaboration and learning, the facility is also a reflection of the school’s commitment to environmental sustainability, as The Pedas Center is finalizing its Leadership in Energy and Environmental Design™ (LEED®) certification this Fall. 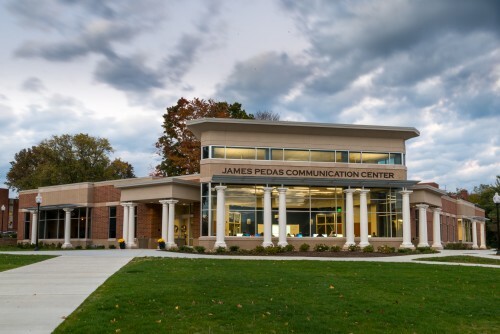 During the dedication ceremony, Dr. Lynn Franken, VP for Academic Affairs/Dean of the College noted that the signature academic program of the James Pedas Communication Center is presentational literacy. “In the Discovery classrooms, students will be engaged and learning about performing ‘presentational literacy,’ which will make our students so employable across the county,” Dr. Franken said. Founded in 1866, Thiel College is an independent liberal arts, sciences and professional studies institution located on a 135-acre campus in Greenville, PA just 90 minutes from Pittsburgh, Cleveland and Erie. Committed to combining the best of the liberal arts tradition with career and life skills, the Thiel College faculty offers a high quality undergraduate education to more than 1,100 students across more than 60 majors and minors in 19 discipline areas that inspire, challenge and prepare students to succeed.